The Hilo Mokume tungsten band possesses beveled edges which frames the mokume gane inlay. 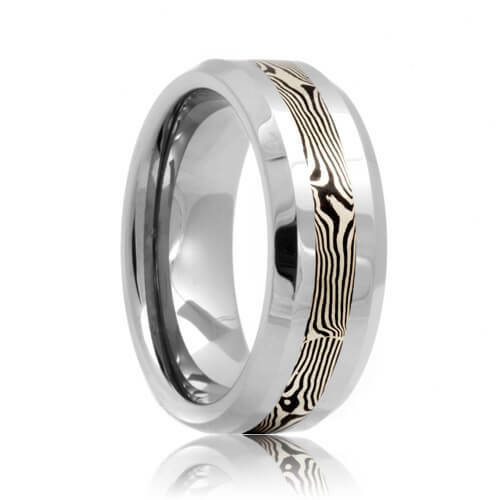 The inlay consists of 14k white gold alloyed with "Shakudo", an additional alloy which consists of 14k yellow gold and copper mixture, to produce a rich pattern throughout the inlay. The inlays on these tungsten wedding bands illustrate an exotic and bold style. The beveled edges produce greater depth and personality. This style is made to order so please allow 5 - 10 business days to manufacture and ship. Free Lifetime Warranty and Lifetime Sizing; pay no restocking fees or deductibles!